The German midfielder’s representative have been in talks with the Gunners for more than a year over fresh terms. The 28-year-old has not spoken to club officials about a new deal since negotiations broke down in February. So much for the talks. What but the done deals? OZIL wants Jack Wilshere’s No 10 shirt as part of his terms to stay at Arsenal. How poor is your side performing? One Sunderland fan allegedly expressed his dissatisfaction with doings at the Stadium of Light by pulling down his trousers and laying a pipe. As the Black Cats toiled to a 3-1 loss to Reading, twitter users claims the man pulled down his pants and pooed on the seat, causing a fan sitting nearby vomit. Reports abound that police took the site-down protestor away. The news was unequivocal: Arsenal forward Alexandre Lacazette is out with a groin injury.” He will not play against Manchester United. 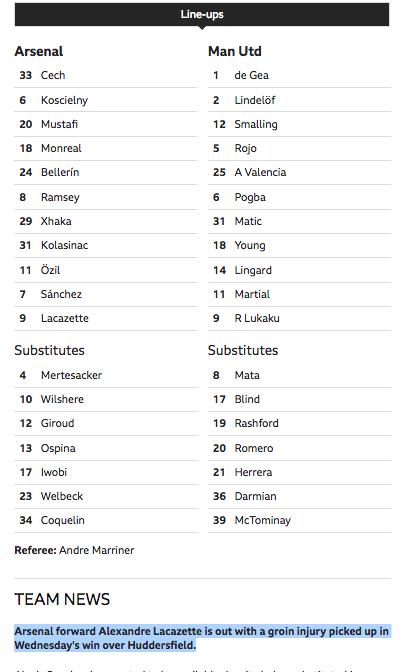 The BBC publishes that news below the teams for Arsenal v United. Lacazette is at number 9. It was Arsene Wenger who said Lacazete will not play – that he’d be “out for a while”. 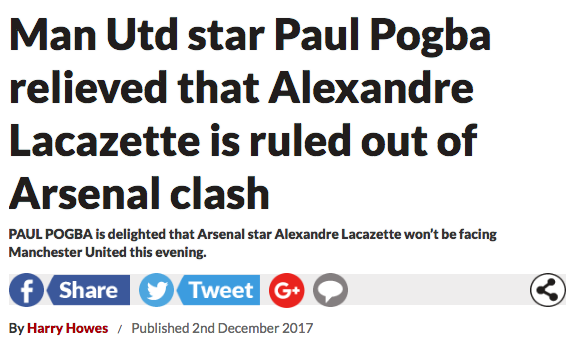 The news of Lacazette’s injury pleased United. As Tottenham slip to 7th place in the Premier League, the Sun elbows its way to front of the queue to bash team manager Mauricio Pochettino. In “Chapter And Worse”, the paper wonders, “Is Posh book to blame for Spurs’ Real Shocker?” The answer is, of course, no. In case you missed Pochettino’s book, Brave New World: Inside Pochettino’s Spurs “reveals secrets behind his success”. He reveals: he likes eating crisps; “Whenever I am slightly down, I like to smell Argentinian wine”; “Poch is very keen on building-up an unbreakable team, spirit”; “the ever-professional Poch…likes to quiz his stars on selected topics from their most recent team meeting if he bumps into them in the corridors… just to make sure they were listening”; and he “once dropped a player for eating LASAGNE”. All those killer facts are in the Sun’s review of the book in an article dated October 27. One month on and, according to the Sun, the book that told of Poch’s “success” and his skill for building team spirit is the catalyst for disaster. The Spurs boss’ book, Brave New World, appears to have jinxed his title-chasing side since it reached shelves on October 26. Mark Irwin tells us that five games ago, Spurs were “Manchester City’s most likely challenges”. Fourteen matches into the season, Spurs are seventh. After nine matches played, Spurs were in third place, five points behind Manchester City. Manchester United were second, surely making them the side most likely to topple City. Reading on we learn that the book “has not gone down well with certain players, who are uncomfortable with some of the manager’s revelations”. The crisps, right? Or was it how he likes to pick the washing powder for the team’s kit? MAURICIO POCHETTINO took his Tottenham stars and Daniel Levy out to dinner this week – at a cost of £7,000. The generous Spurs boss picked up the whopping tab after inviting FIFTY of his club colleagues, including chairman Levy, to his team-bonding get-together at posh West End diner Beast on Wednesday night. Will Alexis and Mesut Ozil will be here on February 1? Will they be at the club next season? AW: I am not the only one who can decide that. They have a part to play in that as well. If it’s my decision, yes. Could he possible envisage them leaving in January? AW: Unless something unbelievable happens, I can’t see why that would change. Arsene Wenger, meanwhile, sparked confusion over Ozil’s future this week by claiming that the midfielder will not be sold in January. Did Wenger name a price? No. When pressed he said it would take something “unbelievable” for Ozil to be sold. Mesut Ozil is interested in moving to Man Utd next year and Jose Mourinho has received some positive news from Arsenal. Can it be that Ozil is on his way to Old Trafford? Are Arsenal and United arranging things? Before reaching the story, we’re told that the MEN is part of the ‘Trust Project’. What’s that? The Trust Project is an international consortium of news organizations collaborating to use transparency to build a more trustworthy and trusted press. It’s clear, then. 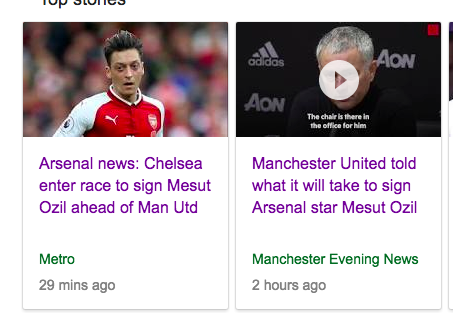 Ozil to Manchester United is on. Mesut Ozil could be a doubt for Arsenal’s weekend Premier League fixture with Manchester United due to illness. And… And nothing. The entire story is that Ozil was ill and couldn’t play for the Gunners at Burnley. He might be ill for when Arsenal play United next weekend. Arsenal have offered no boost for any transfer. The ‘good news’ is that Ozil is ill. So much for trust, eh. Biased Balls: a look at bias in football reporting. Today we look at Burnley’s 0-1 defeat at home to Arsenal in the Premier League. Burnley lost to Arsenal in injury-time for the third game in a row. This time it was penalty converted in the 93rd minute. Transfer Balls: Having secured a new talent spotter in the shape of Sven Mislinat from Borussia Dortmund – he helped the Germans recruit Robert Lewandowski, Shinji Kagawa, Ousmane Dembele and their want-away striker Pierre-Emerick Aubameyang (any Gooners think he’s heading to the Emirates?) – news is of players leaving the club. And chief among them is Mesut Ozil. The Sun says Ozil “is keen on joining Barcelona”. Arsenal are apparently eager to get £20m for the 29-year-old this January. The Manchester Evening News says “Ozil is keen on a move” to Old Trafford for £17.7m. The London Evening Standard says “Arsenal players expect Mesut Ozil and Alexis Sanchez to stay”. Dr. Erkut Sogut , who represents Mesut Özil , has negotiations with Barça . The agent has confessed to the Barça club the tremendous interest of his represented in playing at the Camp Nou, but he has also made it clear that there are six sets more interested in the German international of Turkish origin. 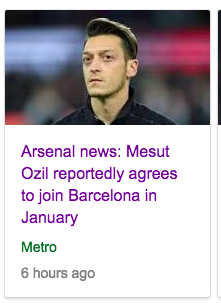 Ozil played for Barcelona’s dread rivals Real Madrid. In addition to the offer to Özil , they want to know what they will do to Arsenal , their current club. And, above all, the time of the duration of the contract, which would want it to be at least the rest of the season and two more years. The club would want that third season was negotiated between the two parties, taking into account the age of the German, 29 years. Not exactly chomping at the bit, then. The advantage of Barça is that Özil has the thorn in the “no” of Pep Guardiola in 2010 and wants to show that he has a place in the Catalan team. He really likes the way Barça played since he was at Werder Bremen . “Arsenal were interested in signing me after the 2010 World Cup, as were Manchester United, Bayern Munich, Barcelona and Real Madrid. My agent sat down with Bayern to discuss a move. The club told him about their plans with me and how they intended to use me. He had similar talks with the other clubs that wanted me. In addition, Özil believes that if he signs for Barça , playing alongside Lionel Messi , he could hope to win, for the first time, the Champions League . If he wants to win that, his agent should court PSG. The Arsenal has given the ‘OK’ to Erkut Sogut that Özil can march on the January market to earn some money, which would not happen at the end of the season to be free. They have the direct permission of Arsène Wenger . Arsenal 2. 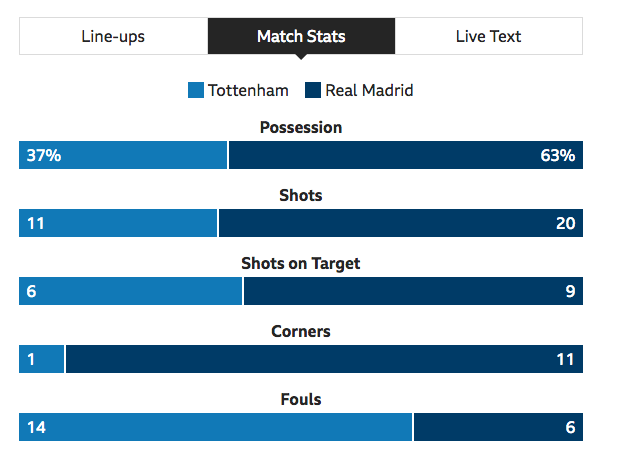 Tottenham Hotspur 0. The Premier League match between North London’s biggest football clubs ended in favour of the Gunners, who were feisty, bright, quick, slick and aggressive throughout. The BBC says Arsenal secured a “comfortable north London derby victory”. Is he right? What say the clubs respective websites? No word on any offside, let alone an “obvious” one. But some comment on the foul that gave Arsenal the chance to launch a set piece. The Spurs report is remarkably even-handed. No word on the foul that led to the free kick at all. And, again, no word on any offside. Tottenham’s anger was that Mustafi, by a tiny margin, seemed offside when Ozil delivered and that free kick had been awarded dubiously when Alexis Sanchez sprawled as Davinson Sanchez nicked the ball away from him: a clean tackle but Dean judged the Spurs man had tugged his namesake’s jersey before sliding in. Sanchez was a whir of buzz an brilliance. But surely Arsenal cannot hang on to the Chilean. Manchester City want him. And they have money to burn. But Ozil… Well, signs are that he will stay. Arsene Wenger gave fans the chance to salute the German by substituting him in the 84 minute. The fans stood and cheered. Oil felt the love. Like Alexis Sanchez, Arsenal’s other stand-out performer on the day, Ozil is entering the final six months of his contract. He is free to talk to foreign clubs from January onwards. Arsenal clearly want him to stay. And Ozil seems happy with his lot. Transfer balls: Jack Wilshere, once the saviour of English football, is making his way back to the fore after a trying time with injuries. Having clawed his way back to the Arsenal bench, Wilshere is now being tipped to get his reward: a career at Real Betis. 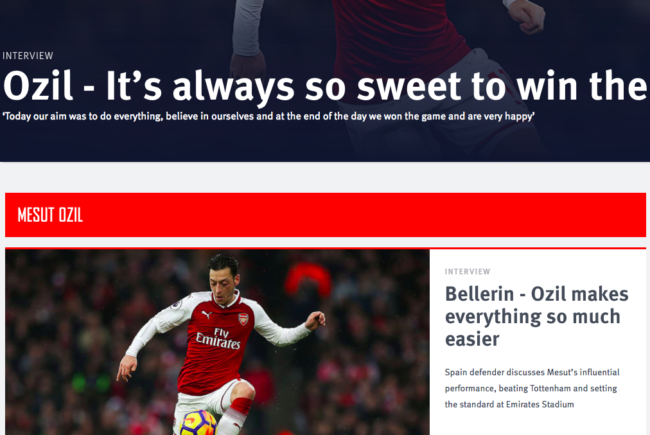 Well, so says the BBC, which reasons that once Wilshere’s Arsenal contract expires in the summer, Betis are “confident” they will get their man and make him part of Spain’s eighth best side. Only a loon would bet on Wishere heading to Real Betis. He wants to remain at Arsenal, and the Gunners are pretty keen on keeping him. 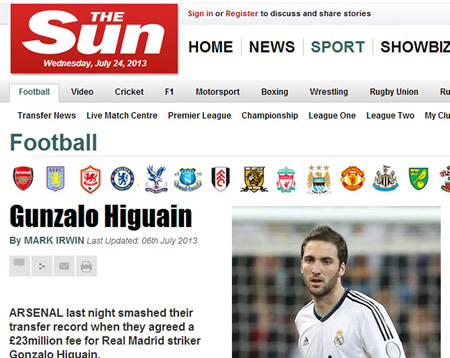 The Sun’s “exclusive” looks a lot like an advertorial for its betting operation, SunBets. 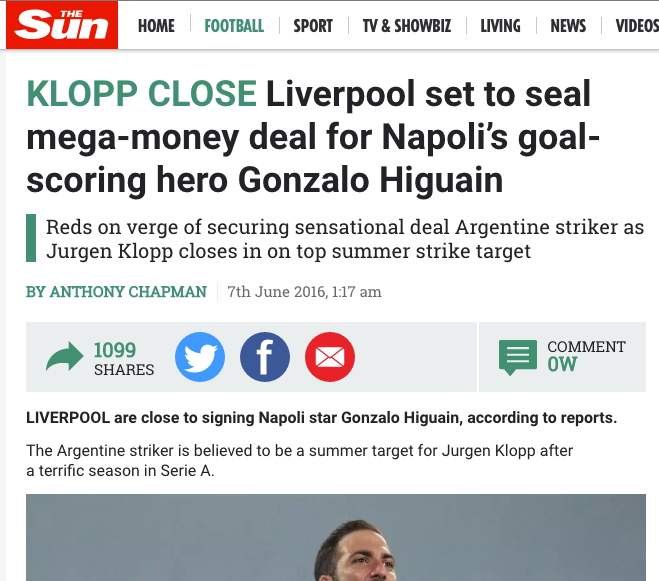 The paper’s scoop comes wrapped around two large calls for readers to sign up to SunBets . It’s all utter balls. But in the race for clicks, where one news source leads, the other dutifully follow. 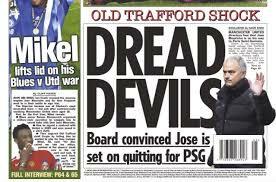 Football moves pretty fast at the Sun, where the paper continues to cheer for Jose Mourinho, currently turning Manchester United into a pragmatic, defence-minded grinding machine. Second in the Premier League, a not inconsiderable 8 points behind Manchester City after just 11 games played, the Sun explain that none of it is Jose’s fault. Nothing a few hundred million can’t fix. Replays showed that Tripper was in an offside position when he received the ball, but there was no call from the linesman and the goal stood. How bad is sports writing? Like everyone else who cares – and many more who do not – we too saw the Arsenal squad wearing their Christmas jumpers to highlight the work of Save the Children. Since 2011, the club has raised over £2million for the charity. 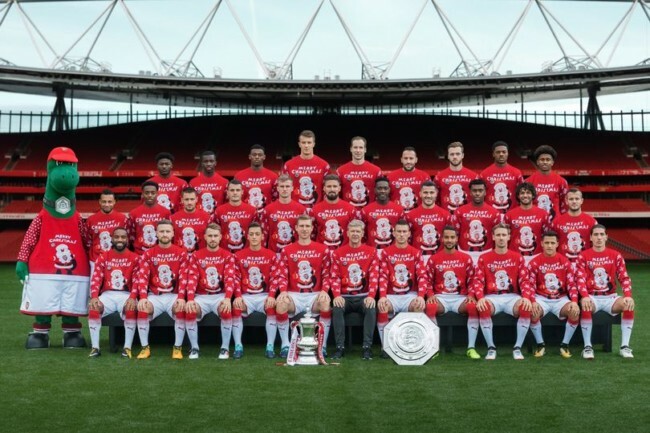 But to the Daily Mirror, this is a reason to produce “7 things we spotted from Arsenal’s charity Christmas jumper team photo”. 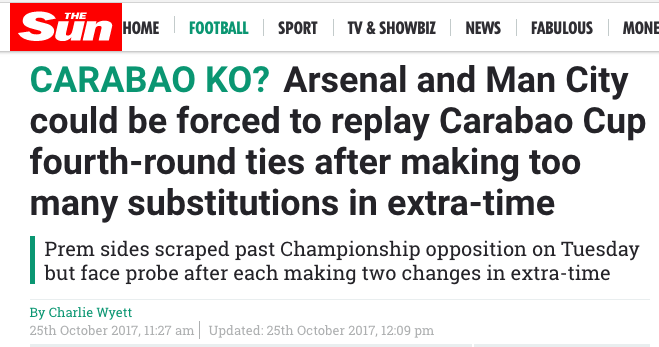 The Mirror provides no link to the charity nor does it mention Christmas Jumper Day (December 15), which is why the Arsenal were wearing seasonal sweaters. Theo “Woolcott”, “Sweater” Cech, “Gra-Knit” Xhaka and the rest of the Arsenal squad have donned festive jumpers for a special squad picture with mascot Gunnersaurus. To help raise funds for our global charity partner Save the Children, we have created a range of exclusive Christmas Arsenal knits, which each carry a 20 per cent donation of the RRP to Save the Children. The Arsenal Christmas jumpers are available from ArsenalDirect.com and from the club’s three superstores while stocks last – in sizes for men, women, children and … dogs! Swap your kit for a knit and sign up for Save the Children’s Christmas Jumper Day on Friday, December 15. Weak of the Mirror not to link their dire article to the charity. 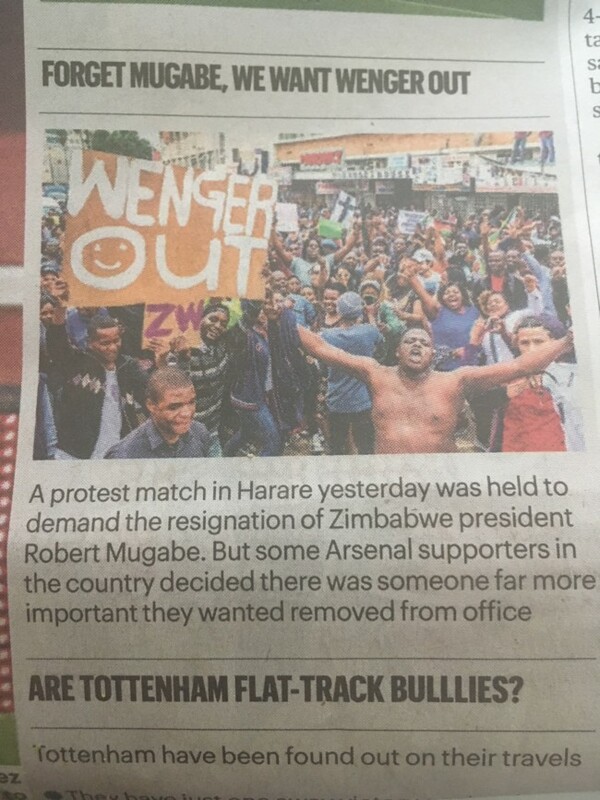 But they do notice that team manager Arsene Wenger is in the photo (Spot 4 on the paper’s list). 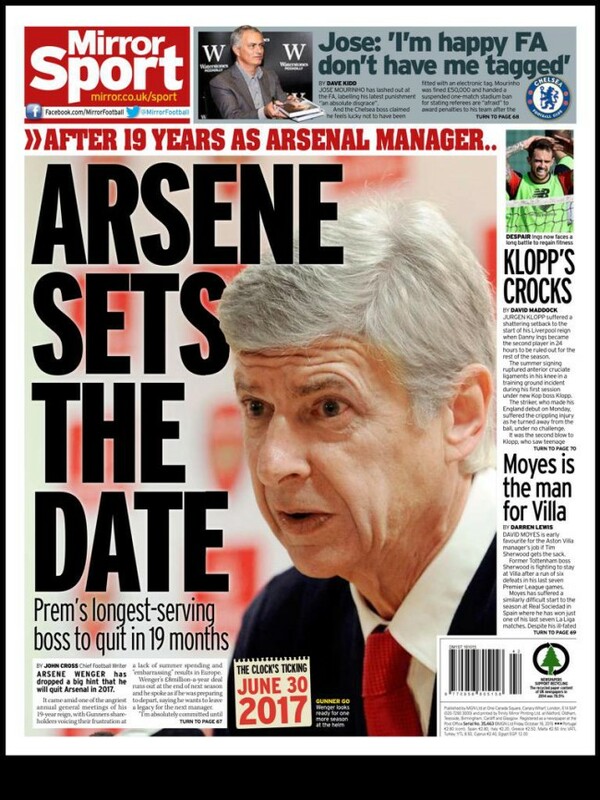 That’s the same Wenger who, according to the Mirror, left the club on June 30. Germany midfielder Mesut Ozil, 29, wants to join Manchester United when his deal with Arsenal expires at the end of the season, says the Daily Mail. “Ozil will be a free agent for next season after telling Arsenal he will not sign a new contract,” says the paper. “Mesut has not had any contract offer from Arsenal. There were talks about a modest pay rise last season but all those talks ended in March. There’s been nothing since then… Mesut is adamant he has never spoken to any player about going to Manchester United. He has no idea if United want him but he wants to stay at Arsenal. Look, he just bought a new house in London. “Mesut had been renting but he decided to buy a house because he both expects and wants to stay. You still there? Anonymous sources are ten a penny. Mesut Ozil has a mouth. He has 18.8 million followers on Twitter. Ozil has 14.3 millions followers on Instagram. Argy-bargy at Everton, where the Toffees lost 1-2 to Lyon in the Europa League. The lowlight features the unforgettable sight of an Everton fan in the Gwladys Street end “trying to shove Anthony Lopes, the Lyons goalkeeper, with his right hand” (Times). The idiot compounded his behaviour by cradling a toddler sucking a dummy at the time. There’s thick and there’s wading into a fight against professional athletes whilst holding a child levels of thick. But before that, what happened? As ever the Press seem incapable agreeing on the most bald fact. Punch? Slap? Hit or miss? They did. And so did the media. Fans and media love a mass brawl. Chuck in a streaker, a few red cards and the match would have been yet more entertaining – albeit not up there with Zidane’s headbutt or Cantona’s kung-fu kick. The dispute is, of course, nothing of the sort. Sanchez has not gone on strike. Arsenal are not sacking him, nor suing him. The Gunners want him to stay. Sanchez wants a lot more money to play for the Premier League’s fifth best team. Negotiations are ongoing. Was this the moment Alexis Sanchez ignored his Arsenal manager ahead of training? The Chilean striker, whose Gunners future remains up in the air, appeared to blank his boss prior to a session at the club’s London Colney facility on Wednesday. Wenger, who was embarking on his ritual of shaking each of his players’ hands before putting them through their paces, was acknowledged by Nacho Monreal and Mesut Ozil – but a short video clip shows Sanchez apparently walking on by. They saw Sanchez head on towards a group of his team-mates instead of approaching Wenger, though the Gunners manager did not offer his hand to his star striker and appeared to say ‘I’ve already done you’. …given reports about a frosty relationship between player and coach in the past, moments like these always give rise to speculation. We do like the Daily Star’s idea Sanchez is “troubled”, in the manner of a recovering drug addict or a Hollywood wild child is ‘troubled’. So, what really heppened? Well, Sanchez was one of the first players who arrived at training, and Wenger greeted him well before the video was shot.